Prime Minister Jacinda Ardern viewing the discovery boxes with Wellington College pupils at the Queen Elizabeth II Pukeahu Education Centre. Discovery boxes containing replica artefacts from the First World War have been distributed to 1000 classrooms across New Zealand, through an exciting new project from WW100 and School Kit, in partnership with Auckland War Memorial Museum and New Zealand Post. Students will use the artifacts in their research as part of a hands-on inquiry-based learning approach. 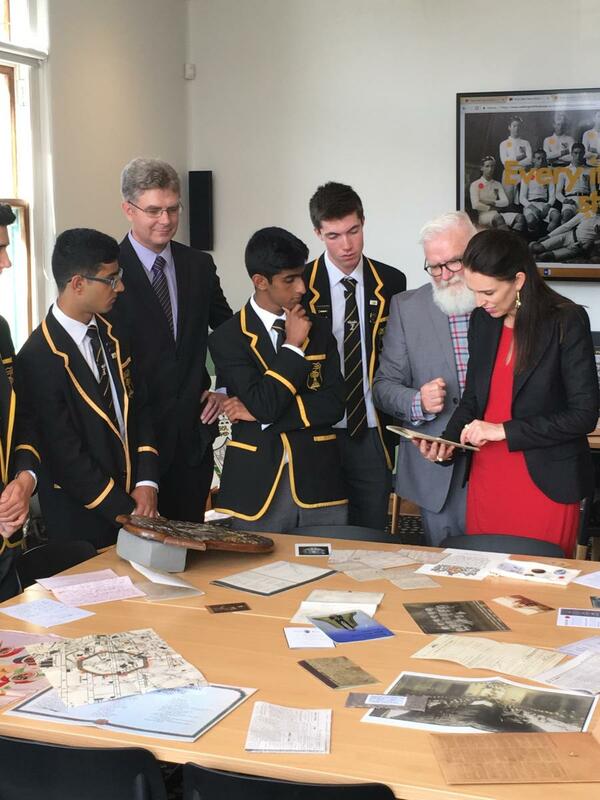 “The boxes form part of the Walking With an Anzac education programme, a project aimed at supporting students and teachers to unearth the stories of local First World War soldiers using the vast array of online records now available,” Jacinda Ardern says. One of the stories children will explore is that of Alexander Aitken and his violin. After being gifted a violin by a friend who won it in a raffle, Aitken played the violin almost every night in the trenches of Gallipoli, bringing the power of music to soldiers surrounded by the sadness of war. She said the project was a great way to engage students with the Centenary of the First World War and ensure that the stories of New Zealanders during the War were never forgotten. “Through Walking with an Anzac, students have already discovered over 2300 forgotten stories of New Zealanders in the First World War; developing a more personal connection with events that impacted their communities a century ago,” Kylie Power co-owner at School Kit said. Thirty two of those stories are explored in the discovery boxes. Parliament Buildings, Private Bag 18041, Wellington 6160.